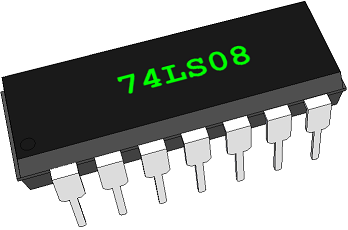 The 7408 IC package contains four independent positive logic AND GATES. Pins 14 and 7 provide power for all four logic gates. Outputs of one gate can be connected to inputs of another within the same chip or to another chip as long as they share the same ground. The figure to the left illustrates a basic circuit showing how to wire inputs and using LEDs to display outputs. Use caution when wiring chip and be sure to check which pins are outputs and inputs! The output is HIGH when both inputs are HIGH, otherwise output is LOW.